Un film di Jennifer Flackett, Mark Levin. Con Abigail Breslin, Jodie Foster, Gerard Butler, Michael Carman, Mark Brady. 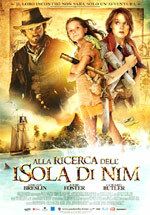 Titolo originale Nim's Island. Avventura, Ratings: Kids, durata 95 min. - USA 2008. - Moviemax uscita venerdì 11 aprile 2008.